I mentioned last week that the saga of the Craftsy Mystery Box of Ugly Fabric had to come an end. I’d been waiting for them to send me 6 more Fat Quarters to complete the Mystery Box of Horrors (since it had only contained 44 out of 50 Ugly Fabrics it was supposed to contain). I’d been corresponding with someone at Craftsy called Bob and that FQ pack is what he sent — 20 FQs rather than the 6 random ones I’d been expecting. I said in that last post that it wasn’t something I’d have picked out for myself, but that I liked some of it quite a bit. Here’s a closer look at what was in that bundle, which is called Garden and is by FreeSpirit fabrics. There’s no other information on the selvedge (about a designer or production year or anything), so that doesn’t feel like much information, but it’s what I’ve got! This is my favourite print and I like it in both colours (though I prefer it in teal). I think these ones will work in my Gypsy Wife quilt pretty well. This kind of paisley-like one is called Floret apparently. You’ll see most of these are kind of busy in a way I don’t often buy — a lot of colours and a lot of pattern. This is my least favourite of the bundle – it just feels… I don’t know. Too sketchy compared to the others, maybe? The print is called Oasis. I didn’t really care for this one – Promenade – to begin with, but I’m starting to come around on it a little. I like it best in the teal, but it’s not too bad. I wish the colours in this one were clearer and brighter, they feel a bit greyed out to me. Anyway, this is Terrace. I never really love border prints – Field Double Border – but I think this could have made an interesting (insane) apron or something along those lines. Or a pillowcase. And finally Courtyard, a big old crazycakes print. I do have some thoughts on the use of these – a couple of them might wind up mixed in with the General Population part of my stash, but I’m thinking I might maybe chop this up into 5-inch squares (or maybe I’ll figure out something better divisible by the size of a Fat Quarter) and turn it into another wonky star quilt (with white stars) or maybe just plain patchwork squares quilt. I don’t know, we’ll see! This is a Stof print, Vine Stripes in purple and white from Pure. I traded this for about a yard of Joel Dewberry stuff I had but couldn’t see myself using. I like how simple and graphic this one is. 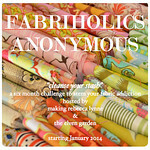 Categories: Fabric Friday | Tags: craftsy, fabric stash, FreeSpirit, Stof, sunday stash | Permalink. Okay, so… usually Sunday Stash posts are fun ones to write – who doesn’t love showing off brilliant new fabric? It’s a gorgeous bit of Bungalow by Joel Dewberry. (Did you see what I did there, letting part of the selvage show with just that bit of info? Inspired, says I.) This, as with everything I’m going to show you today, came from Craftsy. It was the fabric selection for the December Stitch-along workshop. I don’t know if I’ll use this for the intended projects, but if I were still buying fabric, I’d be buying a whole lot more of this. Love it. The fabrics, from the left, are Swallow Study in Teal, Doily in Grassland, Zigtone in Grassland, Dainty Daises in Lavender, and Empress in Grassland. The daisy print isn’t my favourite, but I love the colours so much (and how it fits in with the rest of the prints) that I really don’t care that I don’t like the actual floral print. It just works together. I also picked up this rotary cutter. I’ve been a Fiskars user my entire quilting life and I love my Fiskars cutter, but a lot of people really seem to love the Olfa products so I decided to try one out. I’d tried Olfa years (and years!) ago and hadn’t liked the way the handle felt in my hand, and I think I still prefer the shape of my Fiskars cutter, but this one isn’t so bad really. My biggest issue with it is that I find the locking mechanism kind of… counter-intuitive, maybe. Whatever it is, I never remember to close it after using it. And I dropped an open rotary cutter on my foot once, so I’m usually extremely careful with closing the blades. Maybe it’s because the button on my Fiskars cutter is right by my thumb, so it’s just instinct at this point to shut it, but this one I have to kind of go out of my way to close and it just doesn’t happen a little too often. Anyway, you may have had the impression from my opening line that this wasn’t going to be a good happy fun post full of good happy fun fabric. And your impression would be right. Because at the same time I bought the gorgeous Bungalow fabric and that nice cutter, I also bought a 50 fat quarter Mystery Box. I don’t, as a general rule, buy things that I can’t see first. If I don’t know what I’m getting, generally I’m not going to bother. Too much risk, and I’m not much of a risk taker. But Craftsy had them on for a good price and I thought… well, I like most of what Craftsy sells, fabric-wise; not all of it, certainly, but more than enough. It didn’t seem like such a bad risk, because even though I assumed they’d be selling 50 FQ they hadn’t otherwise been able to sell, surely it’d be part crap, but also part good. Now, the particularly detail oriented among us might be thinking, But wait, didn’t you say it was a 50 FQ box? There weren’t 50 FQs there! And you’d be right, not only did I get fabric so ugly not even a (grand)mother could love it, they also sent me 6 fewer ugly FQs than I was supposed to get. Thanks for taking the time to reach out to Craftsy, I hope your having a wonderful day! I would love to answer any questions your having regarding your recent purchase of the Craftsy Mystery Box. When customers buy our Mystery Boxes we can’t guarantee that every customer will be 100% satisfied with the colors and patterns of the fabric. We can guarantee that the fabric will be of the highest quality from our manufacturer. Our manufacturer puts these Mystery Boxes together so even we don’t know what colors and patterns they contain. They do try to add colors and patterns that they feel people will enjoy and use. That particular Mystery Box did come with 50 Fat Quarters for you to use for any of your future projects. I have mentioned your feedback to our ecommerce team who will follow up with our vendor to ensure this situation doesn’t happen again. We do want to make sure that our members are getting exactly what they paid for. If you’d like I’d be happy to send you 6 more fat quarters to complete your order. Typically, we do not accept any returns on Mystery Boxes. But if you are totally unsatisfied with the fabric in general I will make a one time exception and accept a return for you. In the meantime and as a token of my appreciation I would like to offer you a free class. If you could please let me know if there is a course you are interested in I would love to enroll you in it for free. Please let me know and if you have any other questions, I am always happy to help. I found myself in a bit of bind after that because one of the things my parents were very big on was Personal Responsibility and in this case, I paid a lower price based on the higher risk of not getting any choice on the contents of my Mystery Box. Personal responsibility says that I need to accept the consequences of my actions, so long as I get what I actually paid for, and they did offer to send out an additional 6 FQs to complete the order. Which is why, as tempting as it seems to return the box full of ugly, I didn’t. I requested they send out the fabric (if it’s en route or not, I don’t know – the specific person I was corresponding with has said that he will “do [his] best to pick out something more to [my] liking that way it’s something [I’ll] want to use” but didn’t mention a timeline) and accepted a free class. (Which might be the easiest offer they’ve got, when a customer is unhappy. I picked the most expensive class on my wishlist. Because I might believe in taking responsibility for my actions, but at least I’m going to get something hopefully good out of the deal!) Another part of the reason for keeping the box was just the shipping costs – it was $15 to have it sent to me and it would have been about $20 to send it back. If I had taken the return option, not only would I have felt guilty for not accepting the consequences of my decision to buy, but I ALSO would have spent $35 for guilt plus nothing concrete. That’s a lot of money to spend on negative feelings – I can generate that kind of stuff for free! So that was my exciting Craftsy purchase that I was so anxiously awaiting all those weeks after Christmas. Sigh. But hey! Come back next week to see what the Gods of Gift Certificates and Quilt Backs brought for me. Because that, at least, was a fun purchase, and I love every bit of it. Categories: Accessories & Notions, Fabric Fast/Finish It Up, Fabric Friday | Tags: craftsy, fabric, fabric stash, Joel Dewberry, olfa, sunday stash | Permalink.